It’s been cold, snowy and cozy. We’re feeling festive and generous so we thought we would host a Christmas giveaway! All of our favorite items are up for grabs and can’t wait to share all this goodness. One of our lucky readers will win ALL of this before Christmas day. You deserve a gift this holiday season too! Candy Cane Sugar Body Scrub by Ben & Co. The only required way to enter is to leave a comment telling us what you’d love to win! The rest is optional. We’ll announce the winner next Monday morning (December 16th). GOOD LUCK! thanks for hosting a giveaway full of amazing things! I’m a cookbook addict! AAG is on my list! thanks for all of your posts! Against All Grain is on my lengthy list of cookbooks to purchase. Would love to try all the other goodies, too! Thanks for taking the time to put sound health and wellness advice out in the blog world. So fun! I would love getting that spiral slicer in my kitchen! I would really love the spiral slicer. I love making veggie pasta and I am slowly getting my boyfriend into it as well!! I would love absolutely everything. :) Against All Grain has been on my Amazon Wishlist for a while, and I’ve been dying to try Steve’s Paleo Goods since my hubby and I shifted to a Paleo lifestyle this fall. Thanks for the opportunity! I am obsessed with the spiral slicer right now! Love the idea of using it for both raw & cooked pasta replacements. I’ve heard you guys talk about the Paleo Krunch Cereal..I’m dying to try it! I’ve actually never checked out Against All Grain, but it sounds great! Candy Cane Sugar body scrub sounds amazing! Love anything peppermint… And now I just saw the slicer..that’s so cool! I need that to make cutting veggies easier!! I already have the AAG cookbook (but would love to give it as a gift!) and would love to try that cereal. That spiral slicer! I live for that. Been wanting that cookbook! And the sugar scrub sounds amazing too! I’d love to win the cookbook and get some great recipes! 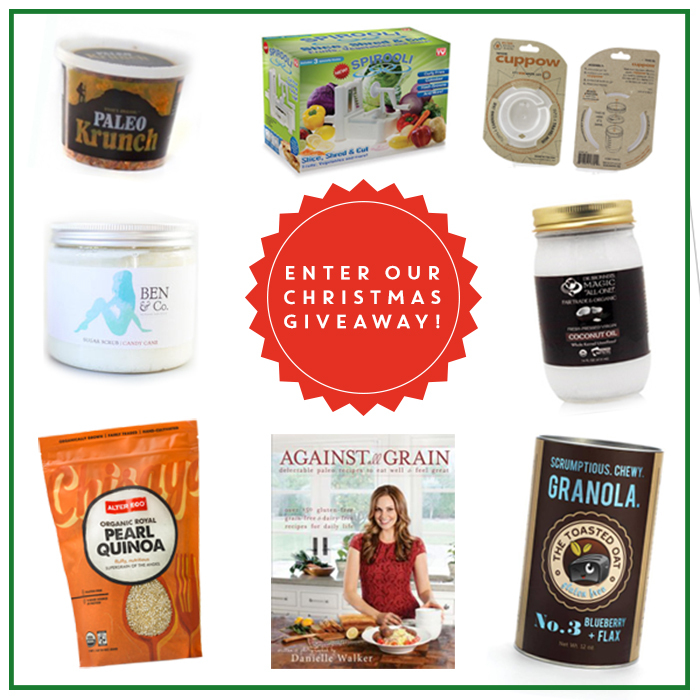 I would love to win the Against All Grain cookbook. I need some new gluten free recipes. Toasted Oat, of course! YUM! I definitely want Against All Grain the most! I even have it on my Christmas Wish List this year! The spiral slicer would make a wicked addition to my kitchen arsenal! Oh gosh, I would love the scrub or the cookbook! I love my spiral slicer so much I would love to win that so I could share the love. Fantastic giveaway! I would really love to try the Paleo Krunch! It’s definitely a toss-up between the spiral slicer and the cookbook!!! I would love this giveaway! I know it’s not the most expensive on the list, but I’d love some White Chocolate + Macadamia granola. I just tried it for the first time today and it’s to die for! Awesome giveaway! I’d love to win the candy cane body scrub! If I were to win, I would be most excited about tasting the Toasted Oat granola! What a great giveaway! I’d love love love to win the Ben & Co. Candy Cane Sugar Body Scrub! I never find the perfect healthy bath products, and this sounds d-i-v-i-n-e! I want the oatmeal!!! I miss it.. I would love to have the spiral cutter! Thanks for this awesome giveaway! I would love Against All Grain or the coconut oil! I would love to win Agains All Grain. This is definitely on my Christmas list! I would love to win Against All Grain. This is definitely on my Christmas list! I would love the cookbook. because one can never have you many of those for ideas and inspirations. Candy Cane Sugar Body Scrub!! I’d love to win the coconut oil since I have never tried it before! I’ve been dying to try the Paleo Crunch! This looks so awesome! I love new cookbooks. I’d love to win the spiral splicer … it looks like so much delicious and healthy fun! I’d like the Spirooli Spiral Slicer! I’d love that coconut oil!